On-Screen Keyboard contains all the necessary keys contained in a standard keyboard. With the feature of “Click Sound”, clicking with the keys all the time can rather be too noisy. To avoid this sort of problem, we can use the feature of turning off the “click Sound”. 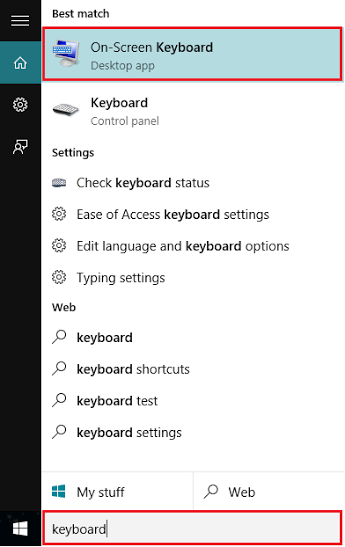 In the Windows Search bar positioned at the bottom left corner of your screen, type “Keyboard”. Click on the first option provided to open the “Keyboard” desktop app. Note: The second option “Keyboard (Control Panel)” will open your Keyboard settings. So, the first option is recommended. Click on “options” provided at the bottom right corner of the keyboard screen. Remove the check mark next to the “Use click Sound” and click on “OK” to finish this process. Note: This action will disable the Use click sound feature. 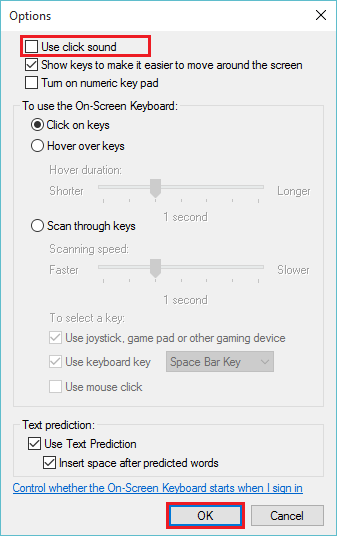 You can also perform some actions like turning on the numeric keypad, text prediction, showing keys to make it easier to move around the screen and controlling whether On-Screen Keyboard starts automatically when the user logs in Windows 10.